Happy New Year!! So much has already happened in the new year, I've hardly been able to sit and write a post. But I've got plenty of great food pictures stored on my computer, so I'll be sharing those with you as often as I can! We're super excited because we're moving into a new house right by my daughter's middle school, and the kitchen has great lighting! There's so much packing to do, but surprise....I've found time to blog again! 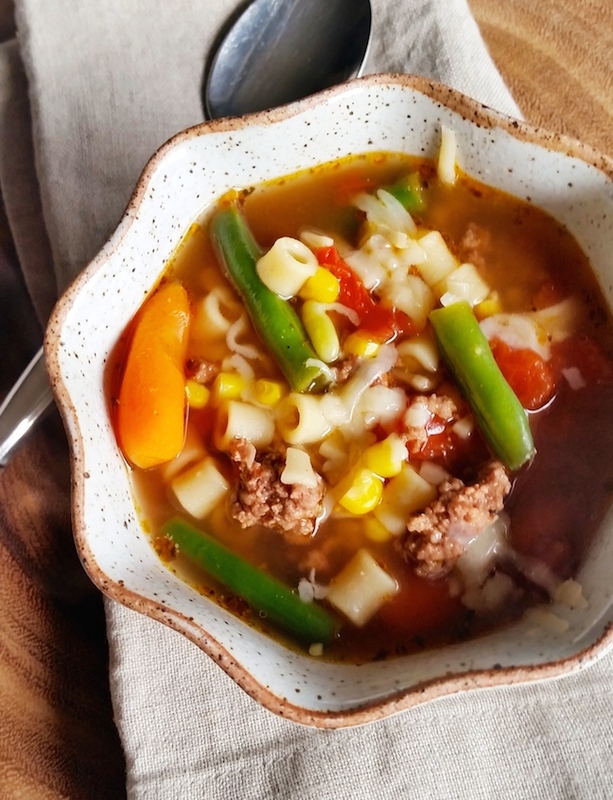 Today I'm sharing our version of minestrone because it's one of my husband's favorite soups. And he's been home and off work for what seems like an eternity. I was once hosting lunch at a doctor's office, explaining my husband's oil work three weeks on and three weeks off, and one of the ladies said, "Oh is that how you make a marriage work?" It's our thirteenth year of marriage, so if we get through this one, that five year wait for a ring will be worth it. My friend Jayne even said, "If one more of our friends beats Thanh down the aisle, she's gonna kill them!" She knew me well. The Italians have many different versions of minestrone soup. Ours is made with our favorite soup vegetables, ditalini pasta, and ground beef. 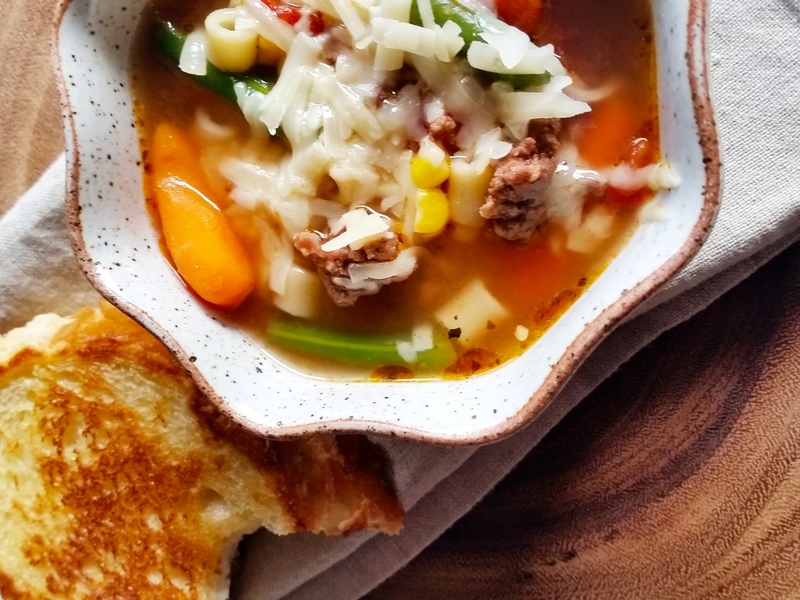 A bowl of minestrone goes great with a grilled cheese. Our favorite version lately has been freshly baked sliced sourdough with smoked provolone or sliced mozzarella. Cooked slowly on medium, getting just the right amount of toasting on the outside while the inside is perfectly melted. 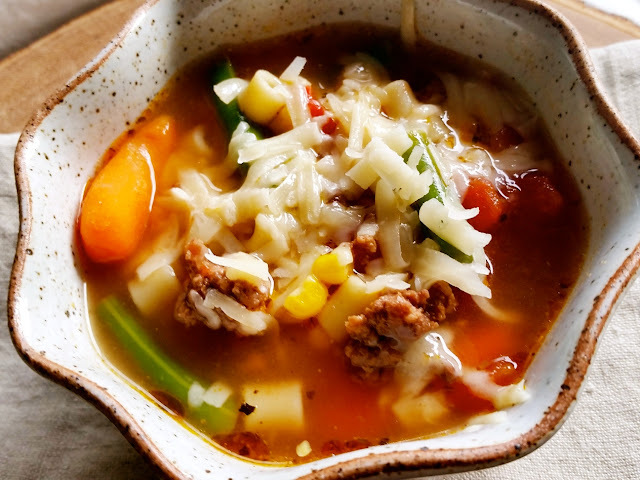 For our version of minestrone, click below. Heat a stock pot on medium high, then add oil when it's hot. Add the onions, stirring for a few minutes. Add the garlic, give it a good stir, then add broth. Add tomatoes, carrots, corn, green beans, oregano, basil, and pasta. Bring up to a boil, then reduce heat to simmer. Brown the ground beef, drain, and add to the stock pot. Simmer gently for 20 minutes. Top with asiago when serving. Salt and pepper as needed.